Beaver Creek resident Wendy Edwards is concerned about a proposed 57,000-square-foot marijuana growing facility that could be built right next door. 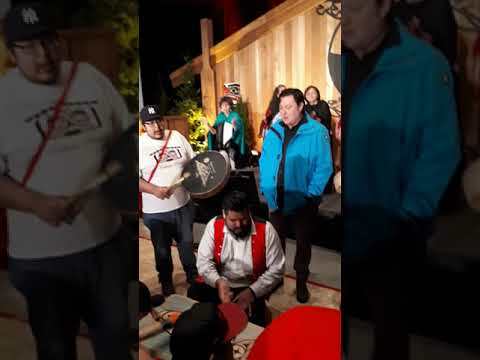 The ACRD (Alberni-Clayoquot Regional District) has issued a building permit for the facility amid protest from neighbors and from Kackaamin Family Development Centre – a First Nations-run family addictions treatment centre. In the August 2018 issue of Ha-Shilth-Sa, Mike Youds reported that the proponent of a medical marijuana production facility was granted a building permit from the ACRD, at 7827 Beaver Creek Road. At that time it had yet to acquire an operating license from Health Canada. “There will be lights on and equipment running 24/7 along with a 50-car parking lot, and there was no consultation with the neighbors,” Edwards complained. Edwards pointed out that the creek that runs between her property and the proposed cannabis growing facility is fish-bearing and the commercial facility, which will require a lot of water to operate, is a threat to a sensitive riparian zone. The Beaver Creek neighborhood has long-standing water issues including frequent boil-water advisories. The property is located in Hupacasath traditional territory but the First Nation is not a party to the development. Hupacasath leaders were not available for comment due to the loss of a community member. Add to that, Edwards’ next closest neighbor is the First Nations addictions treatment facility Kackaamin Family Development Centre (KFDC) across the street. Last August Ha-Shilth-Sa reporter Mike Youds noted that the identity of proponent hadn’t been revealed by the ACRD. The ACRD granted a building permit at 7827 Beaver Creek Road but the proponent had not, at that time, obtained an operating license from Health Canada. Since that time Moni Sadeghi of Premium Cannabis Meds BC has come forward as the owner of the proposed facility. Last summer KFDC Executive Director Sadie Greenaway stated that the proposed Beaver Creek Road marijuana production facility is incompatible with the addictions treatment work carried out at KFDC. In operation at its Beaver Creek facilities for a decade, KFDC delivers services to entire family units, including services for children and youth. The people from the neighborhood gathered at Beaver Creek Hall on Jan. 22 to learn more about the proposed development and to air their concerns. Sadeghi was at that meeting. In a media release issued Jan. 12, Premium Cannabis Meds BC announced they would build a state-of-the art, high security medical marijuana production facility on Beaver Creek Road. The medical marijuana research and production plant represents a $25 million investment that can provide 200 – 300 jobs. Despite reassurances that the facility will be secure, odor-free and quiet, neighbors were not convinced that is it a good fit for their rural residential neighborhood. According to the Alberni Valley News, when one of the neighbors asked if the facility would lower property values, Sadeghi responded by saying having a bunch of drug addicts nearby hasn’t devalued property. Edwards said the crowd booed at the comment and Kackaamin staff left the meeting. In a phone interview with Ha-Shilth-Sa, Sadeghi said she is in the process of reapplying for building permits from the ACRD. “We received approval from the ACRD to build in the ALR (Agricultural Land Reserve) on July 13, 2018, but at the same time the ALR regulations changed, so now we have to reapply for non-farm-use permits,” she said. Sadeghi said the facility will be built and will have the very best equipment that will address the concerns raised from the neighbors about sound, lights and odor. “Seventy-five percent of the property is wetland and not suited for agriculture,” added Sadeghi. She is aware that the neighbors are not happy. “But we’re trying to work with them because they are important to us,” Sadeghi said. Construction on the facility was to begin last November, but with permitting delays and the necessary approval of a second ACRD building permit, construction could begin within the next six months. The facility could be operational a year following that. “We will have 250 full-time employees and another 100 indirect jobs will be created,” said Sadeghi. They will be offering training for the jobs in the coming months and are looking to hire First Nations workers. Recreational cannabis use became legal in Canada on Oct. 17, 2018 and individuals across the country are lining up to cash in. According to Health Canada, under the Cannabis Act a federal licence is required to cultivate, process and sell marijuana for both medical or recreational purposes. It is up to the provinces and territories to determine how cannabis is distributed and sold within their jurisdictions. They set the rules around how cannabis is sold, store locations and how the stores operate. In other parts of Canada, First Nations are exploring the economic benefits of going into the cannabis business. Some are already doing business after having gone through the tedious permitting and licensing process. According to their newsletter, Tseshaht First Nation in Port Alberni is moving forward and applying for licenses to cultivate and sell cannabis. The Mohawk Council of the Kahnawake and Thunderchild First Nation of Saskatchewan have both entered into partnerships with existing businesses that grow cannabis. Grand Chief Joe Norton points to Kahnawake’s heavy dependence on government funding. “We need a stable source of income so that we can then give it back to our people,” he said. The income from their cannabis business could pay for enhanced park spaces, Mohawk language programs, health and, yes, addictions treatment. Opaskwayak Cree Nation (OCN) is the proud owner of the first licensed Canadian recreational cannabis store on First Nations land. Opened Nov. 7, 2018 at Opaskwayak, Manitoba, the 1,500-square-foot retail store is fully stocked with cannabis products. The OCN, like many other Canadian First Nations, are partnering with companies that have already been licensed for medical marijuana. In British Columbia there have been more than 400 commercial cannabis license applications received by the provincial government since recreational use of marijuana was legalized in October. Three months later only seven licenses have been granted for legal sales of cannabis in the province and none of them are on Vancouver Island. The onerous process involves applying for a cannabis license through the provincial government, another license from Health Canada and possibly another from the Canada Revenue Agency. This driveway leads to the proposed 57,000-square-foot cannabis production facility.